Applied social psychology combines the science of social psychology with the practical application of solving social problems that exist in the real world. 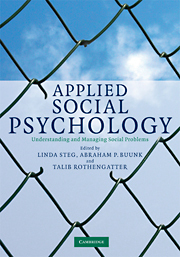 This exciting new textbook provides a thorough explanation of how social psychologists can contribute to the understanding and management of different social problems. A highly prestigious team of contributors from across Europe and the United States illustrate how social psychological theories, research methods and intervention techniques can be successfully applied to social problems encountered in the fields of physical and mental health, integration and immigration issues, gender issues, organizational issues, economic behaviour, political behaviour, environmental behaviour and education. Each field studied features an overview of important problems, the role of human behaviour in these problems, the factors influencing relevant behaviour, and effective ways to change this behaviour. This is an essential volume for all undergraduate and graduate students studying applied social psychology. Provides a general introduction to social psychological theories, intervention techniques and research methods, and how these can be used to solve different social problems. Illustrated with comical cartoons to demonstrate key concepts. All chapters conclude with a glossary, review questions and suggestions for further reading.